Launching is the discipline that brings together process, strategy and creative to create the alignment and momentum it takes to break through tough market barriers and reach your Point B. Please fill out the fields below and submit for immediate download of the Launchonomics infographic. In a crowded, distracted, chaotic marketplace, our launch process brings the rigor, focus and energy it takes to break through. We believe in making decisions based on facts, not guesswork or assumptions. That’s why Introworks has developed tools to give you direct insight into customers’ and prospects’ thinking. BrandFAQsTM is a robust, comprehensive web-based survey that gives you in-depth information on customers’ and prospects’ thoughts about your brand, your competition, and their own wants and needs. 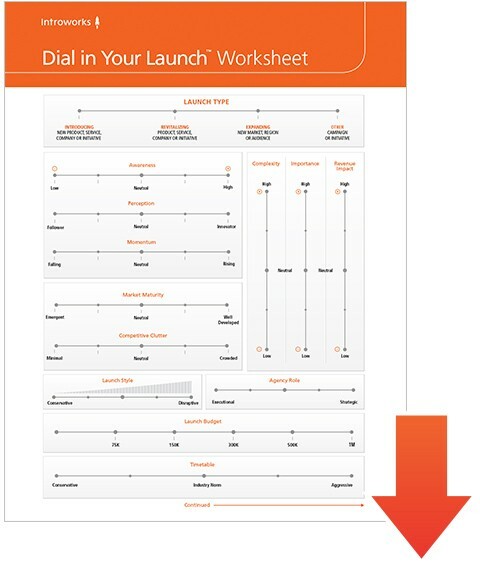 Are you measuring your launch effectively? At all? LaunchFAQsTM is a tool that gives you a clear picture of how well your launch is meeting your goals, how customers and prospects perceive your offering, what’s working, and what needs to be changed going forward. To receive information on our measurement tools please fill out the fields below.